Thanks to your feedback, Swimia has turn out to be in just several months one one of the most important sites of swimming pools. Here you have all the info we know about The Dolphin Swimming and Boating Club at San Francisco Aquatic Park, in San Francisco. 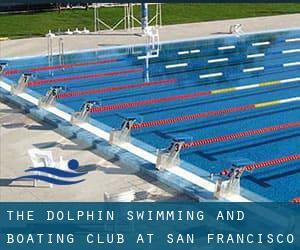 Don't forget you can also promote this pool so The Dolphin Swimming and Boating Club at San Francisco Aquatic Park will appear the very first of San Francisco, or even the first of your country, contact us to know far more. Swimmers like you reported 1/4 mile, Salt Water, Outdoors. Unfortunately we do not have the e-mail address of this Swimming Pool, but we can give you the phone number. On the bay at Fisherman´s Wharf. Updated on 2019 555 N. Point St. , San Francisco , CA , USA (Postal Code: 94133). Swimmers like you reported 50 feet x 20 feet, Outdoors. Unfortunately we do not have the email address of this Swimming Pool, but we can provide you with the phone number. Updated on 2019 Keith Street and Carroll Avenue , Bayview-Hunters Point District , San Francisco , CA , USA (Postal Code: 94124). Among all of the activities offered by the center, when you are interested in swimming you will take pleasure in 25 yards x 25 meters, 3.5 feet - 10 feet depth, Indoors. Just in case you need to make contact with this Pool prior to dropping by, we only know the phone number. Updated on 2019 500 Parnassus Ave., ""I"" Level , UCSF Medical Center , San Francisco , CA , USA (Postal Code: 94143). Among all of the activities offered by the center, should you be interested in swimming you will get pleasure from 20 yards, 4 lanes, Indoors. Just in case you want to contact this Pool before dropping by, we only know the phone number. Updated on 2019 747 Market Street , Union Square , San Francisco , CA , USA (Postal Code: 94103). This sports center delivers 25 yards, 8 lanes, 4.5 feet depth, Indoors. For this Swimming Pool, only phone number is number here. Updated on 2019 Lombard St. and Mason St. , North Beach District , San Francisco , CA , USA (Postal Code: 94133). Swimmers like you have reported 30 yards x 25 feet, 2 double lanes, Indoors. Also, you will find 30 yards x 25 feet, 2 double lanes, 3.5 feet-9 feet depth, Indoors. Just in case you need to contact this Swimming Pool just before dropping by, we only know the phone number. Updated on 2019 2 New Montgomery St. , Financial District / SOMA , San Francisco , CA , USA (Postal Code: 94105). Among all the activities offered by the center, if you are interested in swimming you may enjoy 20 yards, 2.75 feet - 4 feet depth, Indoors. Just in case you want to make contact with this Swimming Pool before dropping by, we only know the phone number. Updated on 2019 Anza St. and Arguello Blvd. , Richmond District , San Francisco , CA , USA (Postal Code: 94117). This sports center offers 100 feet x 40 feet, 6 lanes, Indoors. For this Pool, only phone number is number here. Updated on 2019 150 Greenwich St. , Telegraph Hill , San Francisco , CA , USA (Postal Code: 94111). This great and large sports center lets professional swimmers like you enjoy 20 yards x 45 feet, Indoors. Additionally, within these facilities you can try 20 yards x 45 feet, Indoors. Unfortunately we do not have the e-mail address of this Pool, but we can give you the phone number. Updated on 2019 Geary Blvd. and Steiner St. , Western Addition / Lower Pacific Heights , San Francisco , CA , USA (Postal Code: 94115). Swimmers like you reported 25 yards, 6 lanes, 4 feet - 10 feet depth, Indoors. Unfortunately we do not have the email address of this Swimming Pool, but we can give you the phone number. Updated on 2019 1755 O´Farrell St. , Western Addition / Japantown , San Francisco , CA , USA (Postal Code: 94115). This sports center delivers 25 yards x 38 feet, 5 lanes, Indoors. For this Swimming Pool, only phone number is number here. Updated on 2019 535 Mason Street , Union Square , San Francisco , CA , USA (Postal Code: 94102). This sports center provides 25 yards x 25 feet, 3 lanes, 3.5f - 9 feet depth, Indoors. For this Swimming Pool, only phone number is number here. Updated on 2019 333 Eucalyptus Drive , Outer Sunset or Parkside or Lakeside , San Francisco , CA , USA (Postal Code: 94132). This sports center delivers 25 meters, 4 lanes, Indoors. For this Swimming Pool, only phone number is number here. Updated on 2019 Wawona St. and 19th Ave. (SR-1) , Sunset District , San Francisco , CA , USA (Postal Code: 94116). Swimmers like you reported 25 yards x 23 yards, Indoors. Unfortunately we do not have the email address of this Pool, but we can give you the phone number. Updated on 2019 1950 Page St. , San Francisco , CA , USA (Postal Code: 94117). This sports center delivers 25 yards x 42 feet, 7 lanes, Indoors. For this Swimming Pool, only phone number is number here. Updated on 2019 San Jose Ave. and Havelock St. , Ingleside District , San Francisco , CA , USA (Postal Code: 94112). This sports center offers 100 feet x 40 feet, 6 lanes, Indoors. For this Swimming Pool, only phone number is number here.